Teak Outdoor Furniture ...... Go Gray or Go Golden? 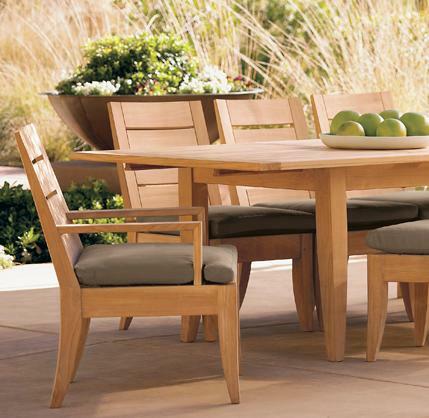 Here at Wood-Joy we sell genuine teak patio furniture, such as teak dining sets, teak deep seat sofa sets, teak benches, teak chaise loungers and teak accessories throughout the entire USA. As you know, there are a lot of different weather and climate that exists throughout all 50 states. 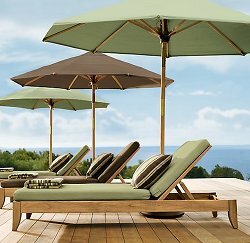 So it is no surprise that there would be many different ways to maintain teak outdoor furniture, as well as marine teak. So you may be considering buying teak outdoor furniture, but are somewhat concerned about the maintenance factor. Maintenance is usually required on most all outdoor furniture and elements if you want to extend the material’s life, not just teak furniture. 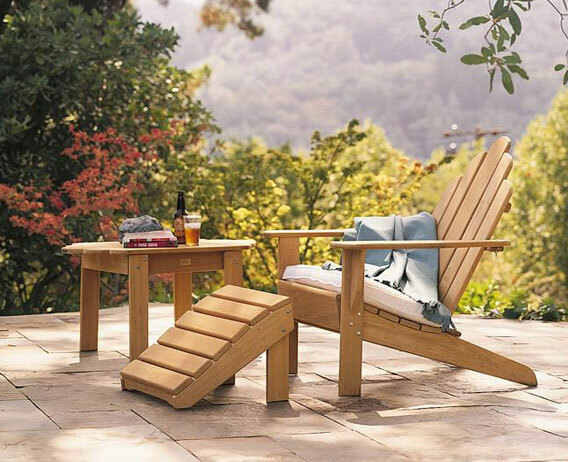 Teak outdoor furniture has natural oil within the wood which helps preserve the wood from rot and decay. But left alone and untreated the color of the teakwood will eventually turn a distinguished patina silvery gray, actually a very trendy look these days. The UV rays from the sun are what cause the graying affects. So if you want to preserve or restore the natural golden look of new teakwood please read on. Wood-Joy has been distributing teak outdoor furniture for many years so we are used to getting this type of phone call, almost daily. 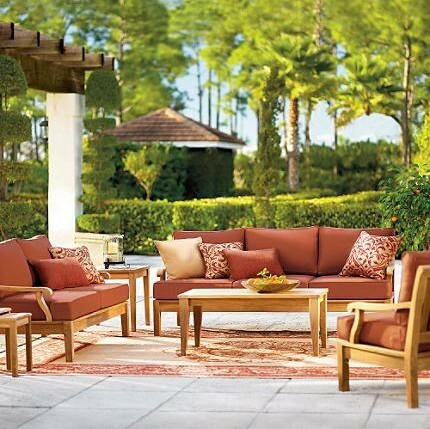 "What's the best way to maintain teak patio furniture"? NEWLY PURCHASED TEAK - Wipe clean all surfaces of new teak furniture, including the underside of tables with soapy water prior to using new cushions. This will help prevent natural teak oil from staining the fabric and pavement surfaces below. To clean natural teak oil from cushion fabric, quickly combine 1/4 cup dishwashing liquid per 1 gallon water and rinse thoroughly. Then use upholstery cleaner such as Resolve®. See the “Cleaning Sunbrella Cushions” link for other types of stain removal and care. Now days, because of new design trends many of our teak customers really do not want the golden look at all. In fact, they actually want to speed up the aging process to achieve a desired patina silvery gray look. Of course, others still desire the original golden tone and this is where the restoration and proprietary product choices come in to play. Regardless of which way you decide to go and no matter how gray your teak becomes, it can always be restored to a golden look later. The natural silver patina color is just a very thin film layer of oxidation and can be cleaned and sanded off to expose the original teak color tone if desired. First of all, there is not much chance of you seriously damaging your teak furniture by applying teak oil or sealers on the surfaces. We try to describe below general means and methods to apply teak oil or sealers if desired, even though it is certainly not required. We strongly do not recommend applying stains or varnish for outdoor use unless applied by a very experienced professional varnish applicator. These varnish experts are commonly referred to as the “bright work” guys. It is hard for varnish to adhere to teakwood because of the natural oils that exists, hence the need for an expert bright worker. If your furniture is to be used indoors and away from a lot of natural sunlight, over a period of time perhaps six months to a year the wood will gradually become a darker shade of golden brown. Plus, if you buff the wood aggressively with cloth the natural oils will migrate to the surface and provide a beautiful satin look. If left outdoors, the effects of the sun's rays will 'bleach out' the timber’s natural surface color, gradually turning it to a soft silvery gray patina color. This silvery gray 'patina' which develops over time gives teak furniture a distinctive appearance. The silver gray color resulting from this natural aging process is considered by many to be very attractive and allows the furniture to blend in well with many outdoor environments. Teak furniture left in this state is easily maintained and needs no treatment whatsoever to give many years of service and this is about as easy as outdoor furniture maintenance can get! PERIODIC CLEANING - We recommend using a strong detergent such as Tide, Wisk or Simple Green with warm water to scrub and rinse your new or aged teak furniture. HOW OFTEN? Like windows in your home or auto, if it looks like it needs washing, it probably does. 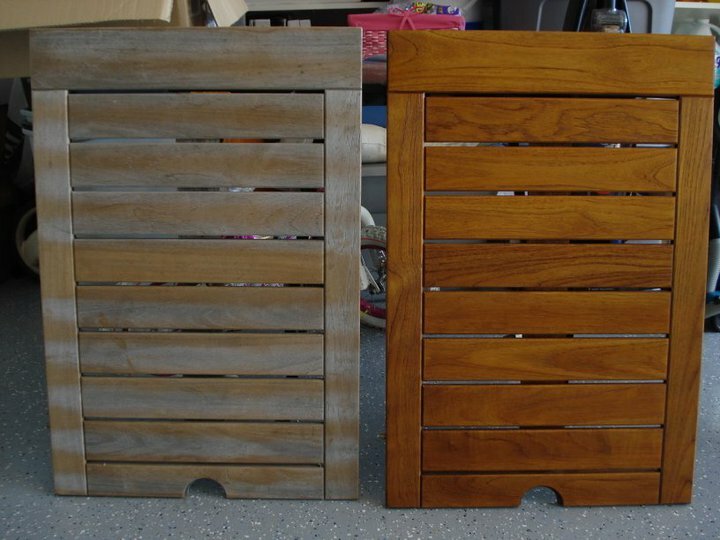 RESTORING OR REMOVING THE GRAY - If you want to remove the gray color or stubborn stains or old sealers, we highly recommend using Semco Teak Cleaner Part A & B kits. THIS STUFF REALLY WORKS! Semco Teak Cleaner will strip your teak furniture down to the natural golden teak wood and is environmentally safe to use. REMOVING MOLD SPOTS - We recommend mixing 1 cup of Clorox bleach with 1 gallon of warm water. First, rinse the furniture with water. Then scrub on this solution with a bristle brush and/or ScotchBrite scour pads. Scrub small sections at a time. Then rinse with water quickly before the solution begins to dry. This should kill the mold spores and look nice once again. Placing your furniture mostly in the sun will help minimize mold issues. SANDING ROUGH SURFACES - If your furniture has become rough from the cleaning, then consider sanding with 120 grit sandpaper followed by 220 grit, being sure to work only with the direction of the wood grains. After sanding you may wish to touch up with teak sealer or teak oil (try to match with whatever was previously used). Or if it had previously been left natural, the fresh teak color exposed by sanding will eventually blend in with the existing silver gray patina. For large areas use an orbital rotating sanding machine (approx. $60.00 at Home Depot) to speed things up. This tool is well worth the cost and can be used many times in the future. We do not recommend the use of high pressure sprayers, steel wool or steel wire brushes. These methods should not be used at all as any metal residue left in the grain will rust and discolor the wood. High pressure water sprayers will blast out the wood fines and raise the wood grains causing a weakened rough surface. TEAK OIL (not recommended) - Teak wood itself has natural oil within requiring no treatment to be used indoors or outdoors. The use of store bought teak oil or sealers won't greatly increase the life of teak, but it does enhance the color somewhat and can also help to prevent stains from seeping into the wood grain, especially table tops. It will slow down the graying effect caused by ultra violet rays. Manufactured teak oil is actually either tung oil or linseed oil blended with resins and other proprietary additives to guard against UV, mold and mildew. Don’t mistake the natural teak oil actually found in the wood from store bought teak oil. The stuff in the bottle or can is called teak oil for marketing purposes. Teak oil can be purchased at most big box hardware stores. APPLYING TEAK OIL - The furniture will need to be cleaned first as described above. 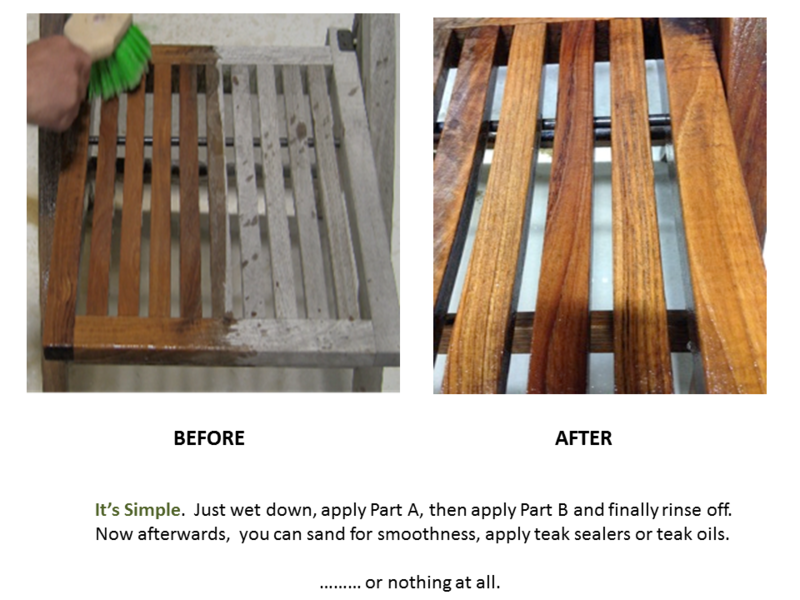 Afterwards allow to dry for approximately 2 days before starting to apply teak oil. If there are any unsightly dings or scratches, we recommend some sanding (120 grit) sand paper and then follow with a light sanding (220 grit) over all viewable and touchable surfaces to give your furniture a smooth silky touch. You will find that sanding is very fast and easy, well worth your time. Don’t waste your time sanding or oiling the bottom of chairs or tables. If you don’t see it, don’t oil it. OTHER ITEMS NEEDED - You will need some teak oil (about 2 pints for a 6 seat dining set), a clean 1" and 3" paint brush, some clean cotton rags, a 32 oz. squirt bottle, good lighting and plenty of space to work in. Be sure to wear some comfortable disposable work clothes. Wearing rubber gloves to keep the oil off your hands is a good idea as well. We recommend spreading some plastic drop cloth outdoors for your work station. A lawn area works pretty well. The oil can be applied with paint brushes or cotton cloth wipe, starting from the top and working downwards. Try to avoid applying too much oil all at once. Thick coatings are not good. If you have a large quantity of teak and want to seriously reduce the time, we would suggest using a plastic spray bottle to apply the oil. You will find the spraying method will oil between the slats very nicely and save you a lot of time. After about 5 - 15 minutes the oil will start to become 'tacky'. At this point the surface of the furniture should be wiped down with a clean cotton cloth, carefully removing all surplus oil. One coat is usually sufficient, but while you are already set up it's suggested to apply a second coat to the viewable surfaces after about one hour. Once you've completed the oiling and the surface is completely touch dry, a second clean cloth can be used to buff up the surface. FIRE HAZARD - Please be sure to dispose of any used rags and cleaning cloth carefully and in accordance with the instructions from the oil manufacturer. Teak oil on rags left in the sun or high heat is very combustible. APPLYING TEAK SEALERS (recommended) - We highly recommend using SEMCO Natural, Honeytone pre-tinted or Clear sealer on outdoor teak. We currently do not sell this, but you can buy it online from various distributors. This sealer is easy, fast to apply and really helps prevent food/beverage stains. One quart may be enough for a small dining set, but for large sets you would probably need one gallon for several applications now and in the future. To speed things up, we recommend placing the teak over a painter’s cloth or plastic drop cloth, sand off any gray color, then spray the sealer on, then back brush or wipe with cloth. The spray technique squirts the sealer in between the slats well. Application once a year is normal, but not required. Use a 32 oz. squirt bottle to apply the sealer. Or some favor just dipping a clean rag in the sealer and then rub on the teak wood. WAIT ON NEW TEAK - With new teak you may notice a glossy/oily surface. Sealers do not adhere to new oily teak very well, so let it set outside in the sun for about 1-3 weeks to acclimate, then apply the teak sealer. TRY TO ENJOY YOURSELF – You may find working with wood to be a joyous occasion. Boat people at marinas and yacht harbors often find themselves at peace when caring for their wood work. So turn on your favorite music and make this an enjoyable occasion. Others simply hire a neighborhood handyperson to handle the rejuvenation. Then again, others just let their teak age gracefully with no maintenance whatsoever. Regardless, teak outdoor furniture requires less costly maintenance than most other high end furniture types and offers a continuing rich natural look for many decades. WOOD-JOY offers free advice on how to care for teak outdoor furniture and guidance on what products may be best for your location and furniture type. Just contact us. We're here to help you. ALWAYS! 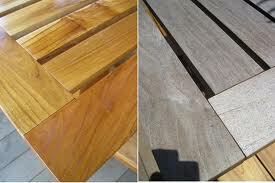 Is teak oil or teak sealer required for your teak outdoor furniture for warranty reasons? No. Teak oil or sealer is not required for warranty reasons. However, these products do help maintain a desired golden look and also helps prevent unwanted stains, especially on table tops. We recommend SEMCO Sealers. How often do you recommend applying these products? The frequency of application is often based on regions. Dry areas require less application and wet climate, especially in the shade will require more maintenance and application. It is likely best to let your teak age naturally in wet/shaded regions. The aged patina color is very popular these days. What type of oil or sealer is recommended for interior teak furniture? We recommend either paste wax, linseed oil, tung oil, or danish oil. Most of these can be found at major hardware stores. Always test for color on underside of furniture. Can we just do nothing to the teak from day one after we receive the furniture? We recommend to at least surface clean the wood surfaces with soapy (liquid dish soap) water that may be in contact with fabric, i.e. cushions or clothing. Just scrub a little and rinse with water. After rinsing be sure to dry the wood surfaces with a dry cloth to prevent dripping onto the chair cushions, decking or pavement below. Is it OK to pressure wash teak outdoor furniture? No. High pressure water blasting can diminish the wood surfaces and cause a very coarse/rough feel to the touch. Pressure washing maybe good for many things, but not fine furniture. Are there gliders on the bottom of your teak furniture legs? We provide adjustable stainless steel gliders on some of our teak tables with SKU # that begin with WL or TS. If you are concerned about the base of your legs getting stained by water wicking, you may consider buying gliders or various leg pads from a major hardware store. These are very inexpensive, easy to apply and absolutely do keep the wood looking great.